A priest who ministered to prisoners and the sick while serving in five parishes in the Diocese of Middlesbrough will be flown home to Ireland for burial after a funeral Mass in Whitby today. 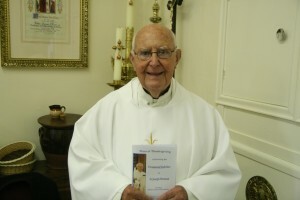 Fr Joe Brennan died at 6am on Saturday 7 March in the Whitby Court Nursing Home at the age of 94. He was born on 6 November 1921 in Enfield, Co Meath, the son of Joseph and Margaret Brennan. Ordained as a Holy Ghost Father on 16 July 1950 at Holy Cross College Dublin, the then Bishop of Middlesbrough, the Right Reverend George Brunner asked him to join his diocese in 1963. His first appointment was at the Sacred Heart Church in Hull, from 1963 to 1968, when he was also chaplain to the hospital and the prison. From 1968 to 1969 he was at St Hilda’s in Whitby before serving at Our Lady of Perpetual Succour in Grangetown from 1969 to 1970. He then moved to a new church, St Anne’s in Eston, where he was also governor to St Peter’s School in South Bank and chaplain to the then Eston Hospital. He was also a counsellor for drink and drugs in Middlesbrough. He remained in his role until 1984 when he became parish priest at Sacred Heart Church in Northallerton, where he was chaplain to the Friarage and Ruston hospitals. He was also chaplain to the prison and built the new school, Sacred Heart Primary, which opened in 2000. In 2001, he retired and lived in a flat in Northallerton, continuing to supply to various parishes. In April 2003, he went to live with his housekeeper and her husband in Whitby. Fr Joe’s funeral Mass takes place today Monday (23 March) in St Hilda’s church in Whitby at noon. He will then be taken to Ireland where he will be buried in Jordanstown Cemetery near his hometown.